Indianapolis, IN, 2018-Aug-31 — /Travel PR News/ — Indianapolis Airport Authority employee Agostos Nyemah has a unique gift among Hoosiers – one that he recently stepped outside of his job description to leverage in helping an international passenger get to his destination. That above-and-beyond act earned him a Hoosier Hospitality Award, recently presented by Lt. Governor Suzanne Crouch and the Indiana Office of Tourism Development. A terminal service employee at the Indianapolis International Airport (IND), Nyemah’s primary job is to keep the terminal in world-class sparkling shape – but he also speaks six languages, a skill that doesn’t always come to light in his primary role. But that talent helped earn him a Hoosier Hospitality Award recently when he assisted a French-speaking passenger who was having trouble understanding how to check his bag. Nyemah put his language skills to work and stepped into translate and pay the passenger’s bag-check fee. Nyemah also spoke with gate agents to ensure the passenger boarded his flight on time. The Hoosier Hospitality Awards recognize a high level of service in tourism-related jobs at hotels, restaurants, attractions and other destinations. This award is given annually to front-line staff members who exemplify Hoosier Hospitality. In 2018, Nyemah also was recognized by Visit Indy as a ROSE Award nominee. The Recognition of Service Excellence program honors non-managerial hospitality employees that treat every Indy visitor with the highest level of Hoosier hospitality, ensuring visitors feel special and taken care of. 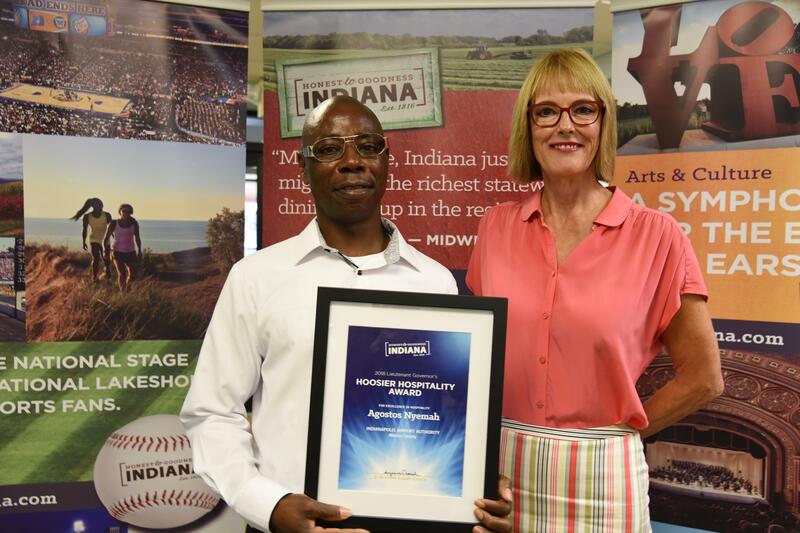 This entry was posted in Airports, Hospitality, Travel, Travel Awards, Travel Services, Travelers and tagged Agostos Nyemah, award, Hoosier Hospitality, Indianapolis Airport Authority, Mario Rodriguez, Suzanne Crouch. Bookmark the permalink.